Contribute to a colonial style dining room or kitchen or add something special to a country furniture collection with the Buckeye Straight Back Dining Room Chair. Tall and slender spindles define the chair back, offering a birdcage-like appearance that's topped with a curving chair crown. Slender stretchers show off the beauty of the solid wood along with the skill of our Amish woodworkers. Colonial style furniture is graceful and refined, representing the style of furniture that was used in the New World. 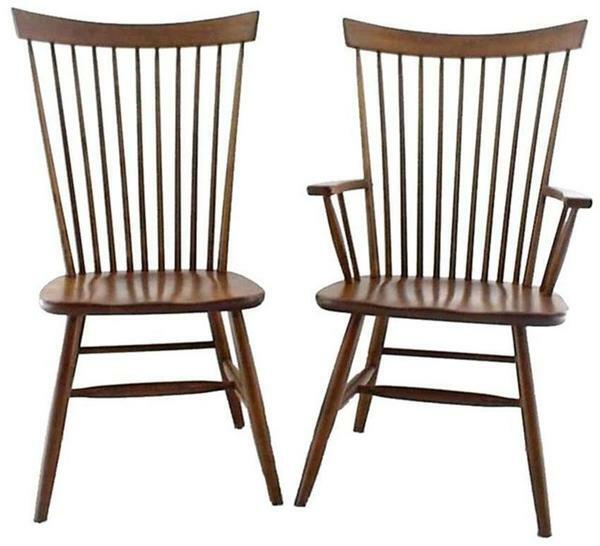 These chairs are named after the Buckeye State of Ohio where the buckeye trees are prevalent. In the heartland of Ohio Amish country simplicity is honored as well as quality of furniture. The goal of the Amish woodworker in the Ohio Chair Collection is to produce heirloom quality furniture that families can enjoy for years to come. Pair these Buckeye Dining Room Chairs with one of our solid wood dining tables. Please call with questions on our Amish furniture. You can reach us toll free at 1-866-272-6773. You can also stop by our Amish furniture store if you are in Sarasota, Florida. Width Between Arms: 17 1/2"
Quality Takes Time – Typical Build Time for This Piece is 8 to 10 weeks. We received our chairs and they are beautiful. Thank you. Just to let you know I received the chairs today. They are lovely and I am very pleased with the workmanship and the navy color.